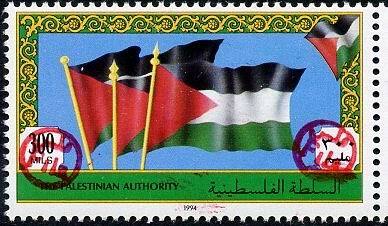 Illustrations below show handstamped overprinted stamps. 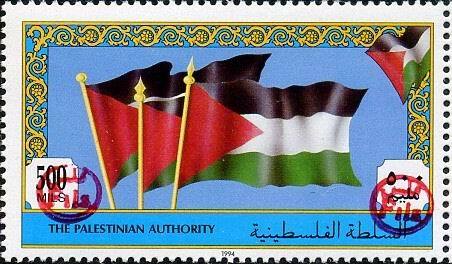 for producing the stamps or the Palestinian Authority. 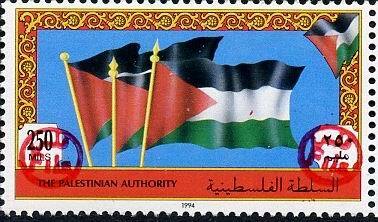 as a favour to an Israeli stamp dealer. 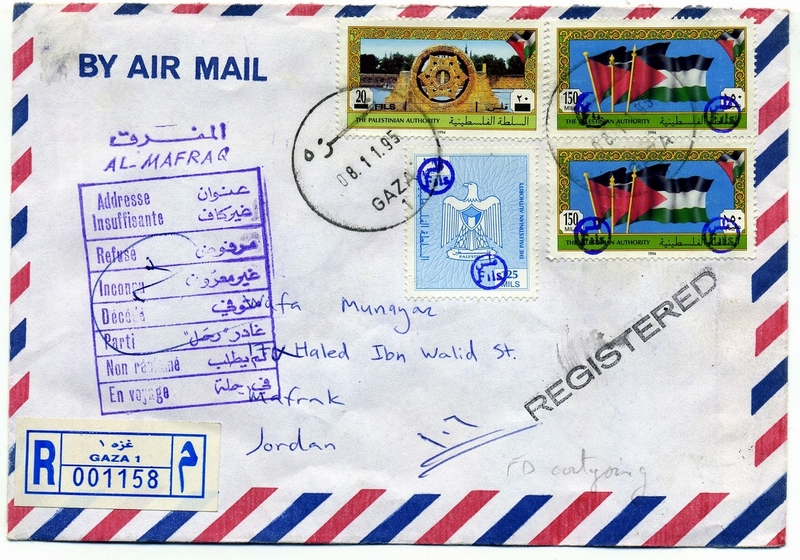 The story about these handstamps is fully explained on this excellent website. Just click on the link below. Any covers with these handstamped overprints were also created by the same dealer and should be regarded as purely philatelic covers. an Excel list (more than 100 covers) is available and will be sent by email to anyone interested in buying one or more covers. Please email us to request a list and further details. 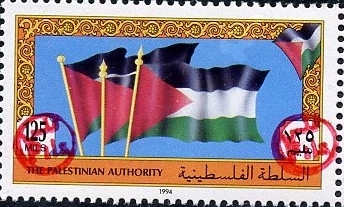 The first stamps issued by the Palestinian Authority appeared in 1994. 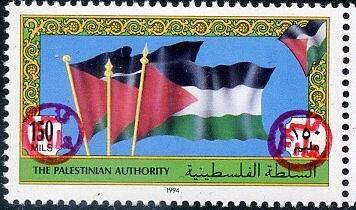 Printed in Germany by Bundesdruckerie and distributed by Georg Roll [now sadly defunct] the stamps depicted the Palestinian Flag [now known as "The Flag set"],with a set of five stamps with values of 125, 150, 250, 300, 500 Mils ; various historic sites of Jericho & Jerusalem with values of 5, 10, 20, 30, 40, 50, 75, 1,000 Mils, and a set of stamps showing the official Eagle emblem with 'Palestine' printed below, and now known as "Officials" with values of 50, 100, 125, 200, 250, 400 Mils. 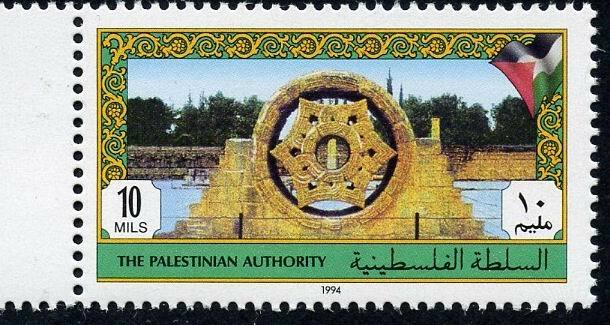 Mils was the old Palestinian currency unit used from 1918 to 1939 during the British Mandate period. 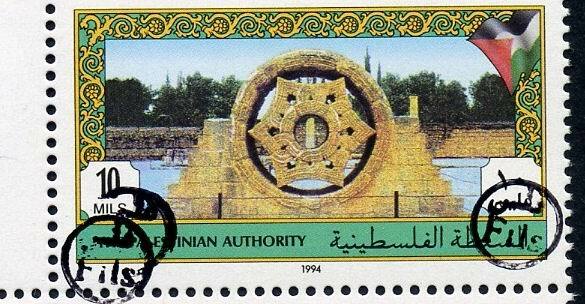 Above; the original 10 Mils value of the "Jericho - Jerusalem" set which became know as "The Sights of Jerusalem" set with overprint and handstamps. 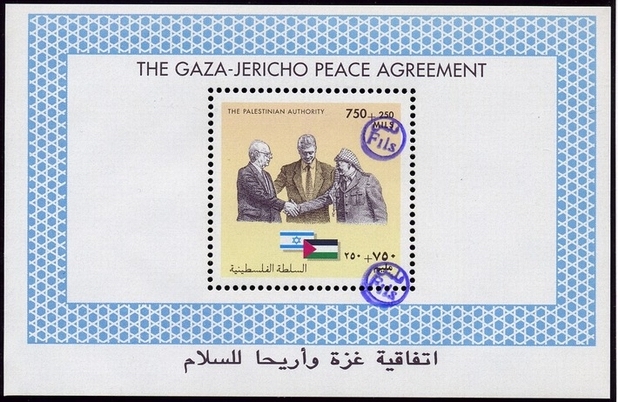 Jericho local hand-stamp - red - on the set of Officials. 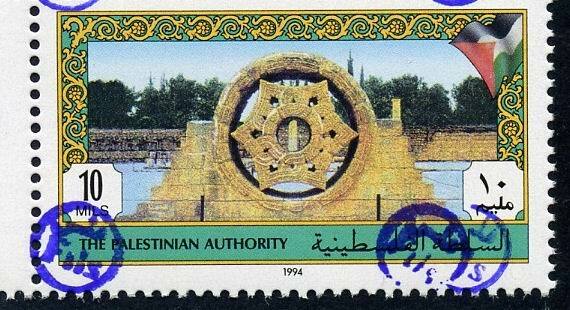 Note 'Palestine' printed beneath the Eagle emblem. 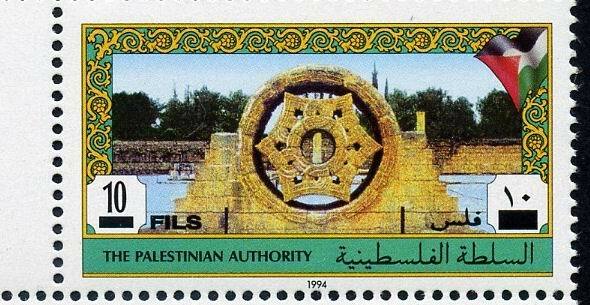 All FDC's have the rectangular 'First Day Local 'Fils' Handstamped Overprint cachet and round Jericho CDS. 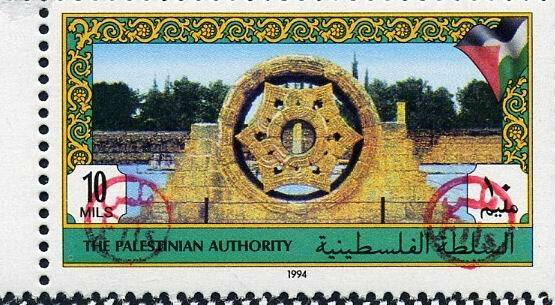 Philatelic covers can also be found with the handstamped overprint - see below.